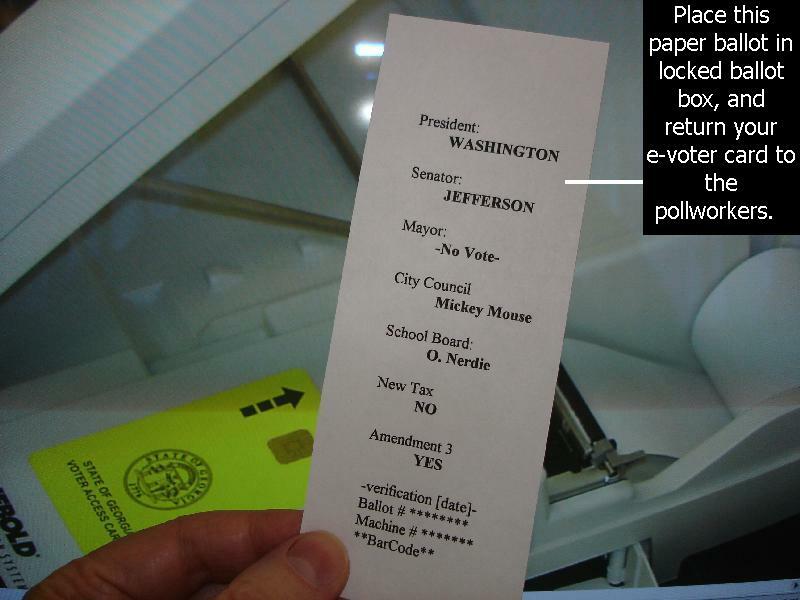 Voter-verified, permanent paper record (pictured below) with a manual audit capacity as a safeguard against computer malfunction or deliberate software fraud. Below shows how to modify the existing DRE Diebold system. Also shown are the tools to create a better system from scratch. 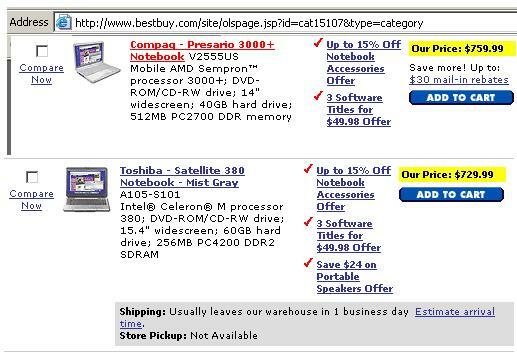 These cheap laptops have UPS - Uninteruptable Power Supply built in. They have more than enough power. 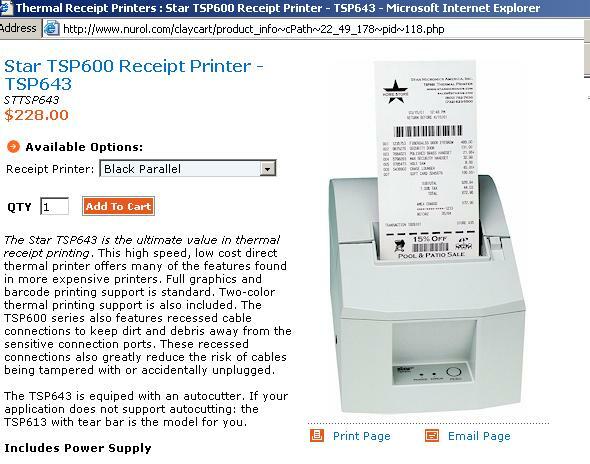 This $228 printer is very robust. This $399 Touch-Screen Monitor is better than the current one used in Georgia. 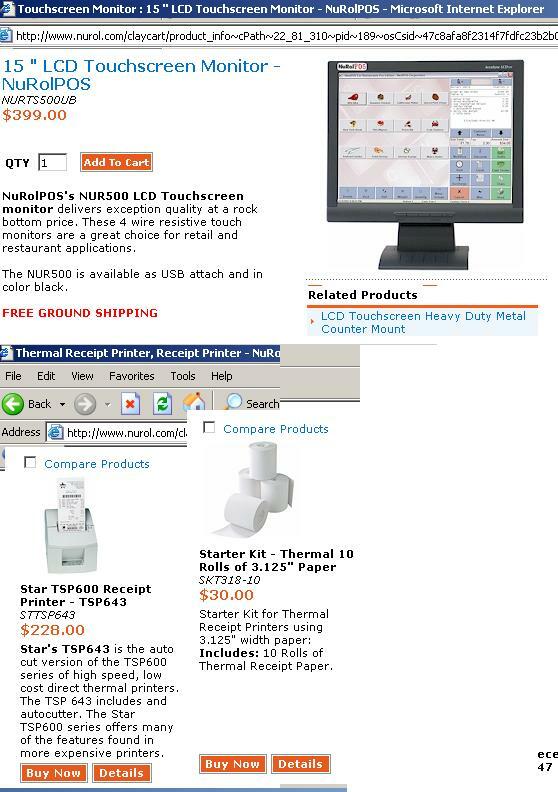 Immediate Solution is available: (See pictures below) - Diebold's electronic vote machines can be reprogramed to print out a voter-verifiable summary of the voter's choices. Use the existing printer in uncovered mode. The voter will return this paper to the pollworker . 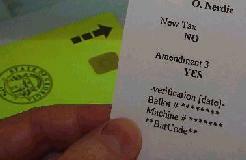 This voter-verified paper ballot will be placed in a lock-box for later use for recounts or routine callibrations. Please call your Representative and Senators. Ask for them to support Federal Legislation to fix the problem. 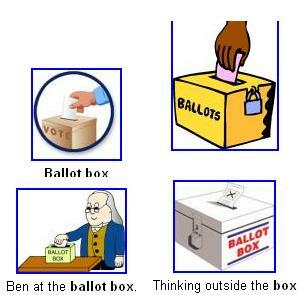 Place your verified paper ballot in the Ballot Box. This becomes the official record of your vote regardless of what the computer may output. Any manual recount of the paper ballots takes precedence over the machine counts. The paper trail is the legal and official vote. Paperless electronic voting machines used throughout the Washington region and much of the country "cannot be made secure," according to draft recommendations issued this week by a federal agency that advises the U.S. Election Assistance Commission. The assessment by the National Institute of Standards and Technology, one of the government's premier research centers, is the most sweeping condemnation of such voting systems by a federal agency. In a report hailed by critics of electronic voting, NIST said that voting systems should allow election officials to recount ballots independently from a voting machine's software. The recommendations endorse "optical-scan" systems in which voters mark paper ballots that are read by a computer and electronic systems that print a paper summary of each ballot, which voters review and elections officials save for recounts. I am one among many who have no confidence in the way that DRE Diebold electronic voting machines are used in Georgia. Did your vote count in the last election? The fact is that you don't know. The actual count will remain forever unknown because a meaningful audit is not possible without a voter-verified paper ballot trail. Diebold and the Georgia Secretary of State have decided to inactivate the paper printers during your vote. And the printout port is covered with a locked plastic panel until all voting is over. The Diebold "faith based voting" system asks that we trust secret software and corporate impartiality. Faith based voting? Trust? Trust has no place in competitive elections. Subject: Voting technology - open solutions are needed + Photo-Voter-Id - free and universal. 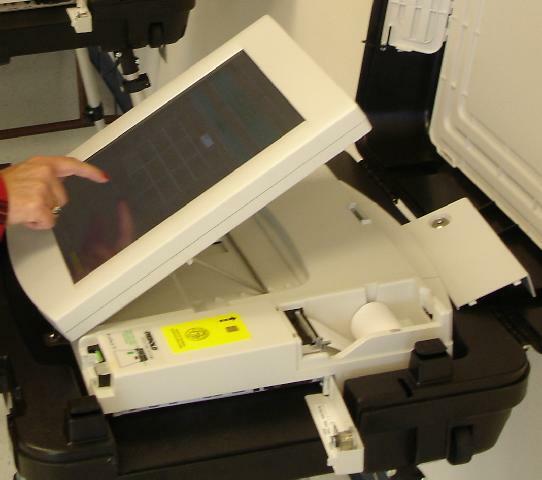 The existing Diebold technology used in Georgia can use a webcam mounted on the voting machines to provide a "universal and free" instant Photo-Voter-ID. Simple, effective and fair to both sides. 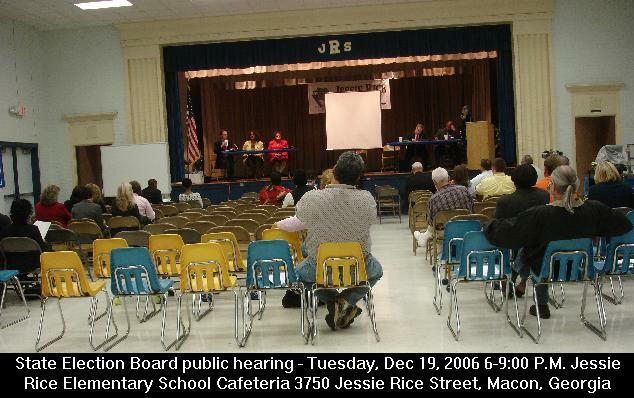 On December 19th, I attended a forum at Jessie Rice Elementary School hosted by the State Election Board to review voting procedures in Georgia. The paper ballot experiment conducted by Diebold was reported to be awkward and difficult to audit. Diebold has long maintained that paper ballots are too expensive and time consuming to be feasible. So it is no surprise that their experiment became a self-fulfilling prophesy. Diebold hopes to continue their lucrative control of the Georgia vote counts by using only their trade-secret software. There is no excuse for any secret methods to be involved in the tabulation of our votes! Secret ballots? Yes. Secret counting methods? No. Voting system technology must be fully open to public scrutiny, and also to timely and independent verification and calibration.